If you love Amish Friendship Bread, having an active starter on hand is a must. It’s usually passed from person to person, so each bag of starter carries with it a little bit of love from the kitchen it came from (and any kitchens before that). Amish Friendship Bread starter is the heart of what makes Amish Friendship Bread so special, because it’s all about sharing what we have with others. A little starter, in other words, can go a long way. But what if you don’t have any starter and you’re dying to make some Amish Friendship Bread? Here’s the recipe for making your own starter so you can not only bake for yourself but get some AFB love going in your community. This post contains affiliate links. If you click through and make a purchase or sign up for a program, the Friendship Bread Kitchen may earn a commission at no additional cost to you. We are grateful for your support! Follow the 10-day instructions for caring for your starter. On Day 10 you’ll divvy up your starter by measuring out 1 cup for every gallon-sized Ziploc bag and reserving 1 cup for you to bake with. You might end up with 4 to 6 Ziploc bags, depending on how active your starter is. You’ll then pass those bags to friends, neighbors and co-workers in your community and bake two loaves with your 1 cup. If you only want to make Amish Friendship Bread once, you’re done. But if you want to be able to bake it whenever you’d like, save an extra bag for yourself and either toss it in the freezer until ready to use or start the process all over again, treating Day 10 as Day 1. The starter tastes better over time, so rather than making it fresh whenever you want some Amish Friendship, consider keeping a bag on hand. Cover loosely and let stand at room temperature until bubbly. Consider this Day 1 of the 10-day cycle. For the next 10 days, handle starter according to the instructions for Amish Friendship Bread. Your yield may exceed 4 cups depending on the temperature of your kitchen and eagerness of your starter. If this happens, reserve one cup for baking and divide the remaining batter into Ziploc baggies of 1 cup each to freeze or share with friends. For instructions on how to care for your Amish Friendship Bread starter for ten days, click here. We also have a bunch of FREE instruction printables so you can gift your starter in style! If you’re keeping an active starter on hand and baking every 10 days, consider giving your starter a happy home. Over the years I’ve used anything and everything you could store your starter in. Right now my favorite is the 9-cup Bormioli Rocco Fido Square Jar with Blue Lid (below). I can’t even begin to tell you how much I love it (hint: a lot). It’s around $10 on Amazon and leaves plenty of room for your Amish Friendship Bread starter to grow. It’s dishwasher safe and actually makes your starter look GOOD. One of the most frequently asked questions is, “Why do I have to use commercial yeast?” Well, the answer is that you don’t. You can try to get your starter going just by letting it grab the wild yeasts in the air, but unless you live in San Francisco, it doesn’t always work. Commercial yeast gives your starter a kickstart, and after that it will use the wild yeasts in the air to keep itself going. In case you were wondering, Amish Friendship Bread starters are a variation to your classic sourdough starters. The flour, sugar and milk feed the starter, and that’s what gives your Amish Friendship Bread starter its unique flavor. For those of you who are new to Amish Friendship Bread, it may seem strange and even unsanitary to keep it on the counter, especially since the starter contains milk. But the starter is quick to break down the flour, milk and sugar and it’s a fermentation process that seems to keep itself healthy. Smell. Should be yeasty and beer-like. If it smells sharp and hasn’t been fed in the past 4-6 days, give it a feed and then give another sniff in 24-48 hours. Bubbles. After a feeding, it should be active and bubbly within 24 hours. This is especially true for brand new starters on Day 1 and Day 6 feedings (which means you’ll see activity fairly soon). On other days it may be “quiet” or flat like pancake batter, but a quick stir should reveal a few bubbles. It’s important to squeeze the bag or give your starter a stir on a daily basis, just to make sure all the ingredients have a chance to get metabolized. Here’s a picture of an Amish Friendship Bread starter on the morning of Day 7. The bubbles had been going all night after its Day 6 feeding, and have formed a little crust. Don’t panic, just stir it back in and go on with your day. Have more questions? Check out our FAQs or read on below before leaving a comment. Most of your questions are most likely answered in one of the two places. We also have several tutorials to help you troubleshoot any starter issues you may have. Want to know what your starter’s doing when you’re not looking? Could I use almond milk? Yes, though we’ve noticed the nut milks and rice milk starters don’t look as active as the dairy-based starters. 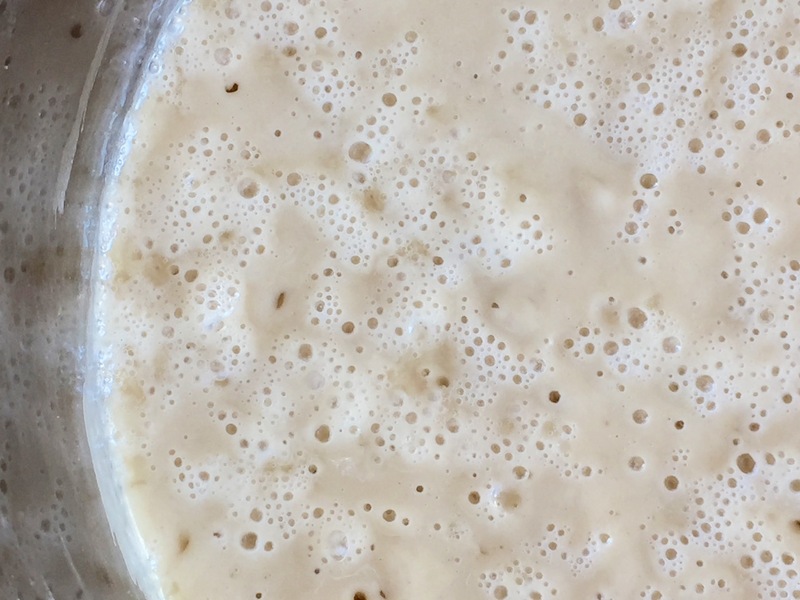 You definitely want to keep an eye on your starter to make sure it’s bubbling and frothing, especially 12 hours after a feeding. We’ve also started a starter on regular milk and then continue to feed it with rice or almond milk if we were out of regular milk, and that worked fine. Hello I have a question regarding freezing my bag. I received a bag from a friend and did the whole 10 day cycle. I separated my bags and gave some away and kept one and froze it. But I’m confused on what I do when I take it out of the freezer? Do I add anything to it and treat it as Day 1? I would like to continue making some. Thank you! Hi Felicia! Did you see our tutorial on reviving frozen Amish Friendship Bread starter? It’s here: https://www.friendshipbreadkitchen.com/tutorial-reviving-frozen-amish-friendship-bread-starter/. In a nutshell, let it thaw it room temperature 12-24 hours, then mash it up and bake with it or treat it like Day 6 and do a feeding and continue on until Day 10 (preferred method). Good luck! I made Amish Friendship Bread years ago and was thrilled to see I could produce a starter, so is my family :D! 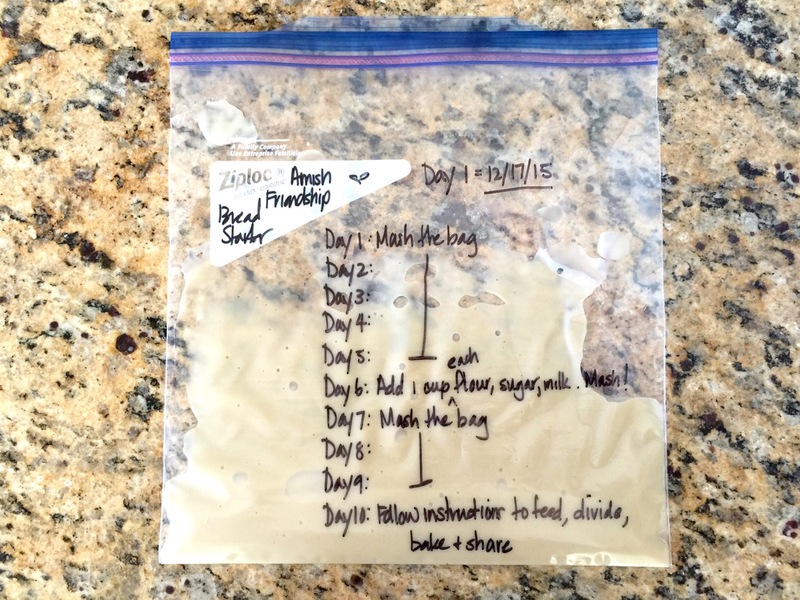 I’ve completed my 10 days and want to start the bread itself, but I’m not sure what type of measuring cup to use when removing starter for the individual zip-loc bag, dry or liquid? Also, when the starter comes out of the freezer do I start from day 1 or is it ready to use as the cup I’m using now? Thanks in advance :)! Hi Theresa–Great question! For liquids, you can use either — it’s exactly the same (you can test this by pouring 1 cup of water into a dry measuring cup and then pouring that into a liquid measuring cup. Still 1 cup!). It’s only with dry items that you want to be more precise and the type of measuring cup you use, or scale, can make a big difference. Using a dry measuring cup for milk or water is also messier as there’s no room for a shaky hand–there’s no room for forgiveness in a dry measuring cup since it’s measured right up to the rim. We’ve found with the starter that it is definitely easier to use a dry measuring cup to get exactly 1 cup. Hope this helps! Made this years ago before computers ever came out. Made Banana Bread with it, added pineapple to some, would try it different ways as well as regular Friendship Bread. Sounds delicious, Ruby! Yes, Amish Friendship Bread goes way back–it’s one reason we love it here! It will, but we’ve noticed the nut milks and rice milk result in a quieter starter. Unless you are completely dairy free, you can try starting your starter with milk and then continuing to feed it on almond milk–we’ve had good results with that. Just make sure you’re seeing bubbles and that your starter is active 12-24 hours after a feeding. Keep us posted! Question: Can you mash the bag too much? My kids love mashing it. Does the yeast need a rest time to activate?? I’d appreciate a quick response as we are doing this now. Thanks so much!! You can never mash it too much! It really likes to be mixed as often as possible. It’s an age-old recipe. I would only add that you can stir the mixture in the bowl with a wooden spoon. I had to go to 2 – 3 other websites to find out that you can stir the starter mixture instead of storing the starter in a ziplock bag. OK OK OK I am a “by the recipe” kind of guy and I do take recipes literally the first time I make a recipe. I wanted to make sure I got it RIGHT. Hi James! Absolutely — we prefer the mixing bowl and wooden spoon method, and use t all the time. The advantage here is that the starter really gets exposure to air and the wild yeasts floating around, while the air supply inside the bag is limited. It works well to pass the starter along in a bag or store it in the freezer that way, and then transfer the starter into a mixing bowl for the 10-day journey! I make this bread every Christmas. I have used the same starter since 1995, always in a bowl. I use the entire recipe myself to make 4 loaves of bread, and freeze my one cup for a year. It’s still bubbling, and yes, we call it Herman. I’m going to a church event and want to bring these as gifts 16 days from now. Can I make the starter now and just continue to feed it? (feed on day 6, 10 and 16?) Or should I just wait to make the starter so day 10 falls on the day I need to bake. You said it tastes better the older it gets so I thought maybe it would work to start now instead of in a week? Hi Becky! I’d make them now and put the date 16 days from now as Day 1 (so people what to do if they follow the instructions). One everything is bagged up and labelled, throw them in the freezer. Then you just need to take them the day or day before so they can thaw and you can attach the instructions or whatever else you’d like to do. It’ll be just fine if you’re off a day or two, but do it now so it’ll be one less thing to worry about later. 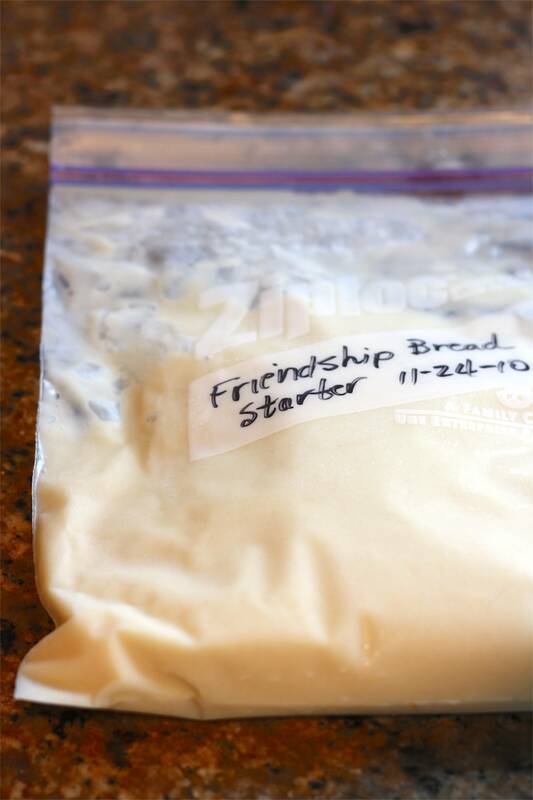 You can check out our tutorial on reviving frozen starter if you have any questions: https://www.friendshipbreadkitchen.com/tutorial-reviving-frozen-amish-friendship-bread-starter/. Have fun! Can soy milk be used in place of regular milk? My bag didn’t seal all the way and part of it leaked out. I would say about half. Should I still add the same amounts on day 10 or is it reined? Love this stuff! My ex used to make it 1 X month and give away. Never got the starter from her, so I made my own a month ago! Turned out great! Just made 6 loaves today! Man is it some kind of good! P.S. I didn’t have any plastic or ceramic bowls, so had to use stainless steel. Was worried it wouldn’t turn out, but it did! Not sure why that is mentioned, but the time in the bowl was about 5 minutes, so maybe it didn’t matter? But it is GOOD! There are several kinds of starter cakes that my mom used. One is a 30 day bread. Could you please send different recipes that I can try. One had lots of fruits in it. 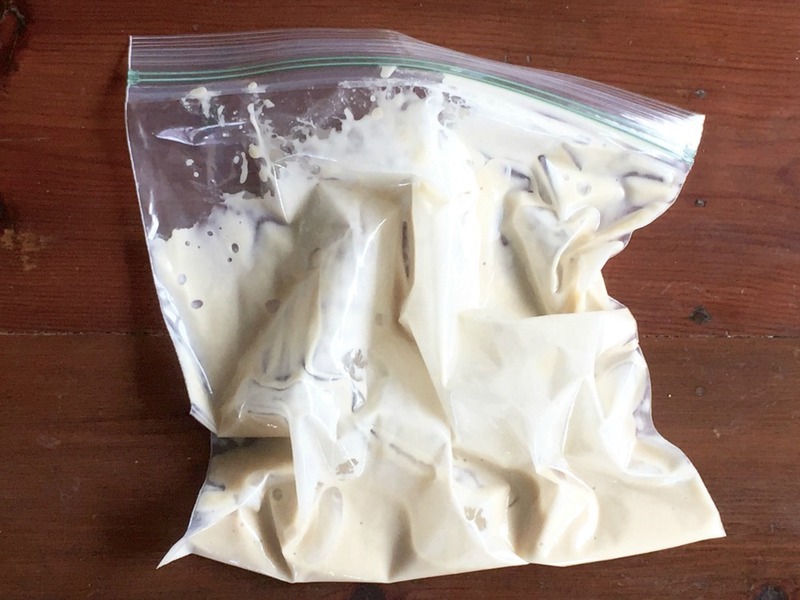 I started a starter with the yeast, milk, sugar, flour and put it in a zip lock bag 3 days ago. It’s pretty runny and it smells like beer. Is this normal? I’ve never started it before. Hi Keri — yes. You should have had some activity (bubbles, etc.) after the first day, if not your yeast may be old. On Day 6, when you do another feeding round, you should see activity within 24-48 hours. The yeasty beer smell is right (fermentation) but you want some action, too. If I have a big enough bowl. 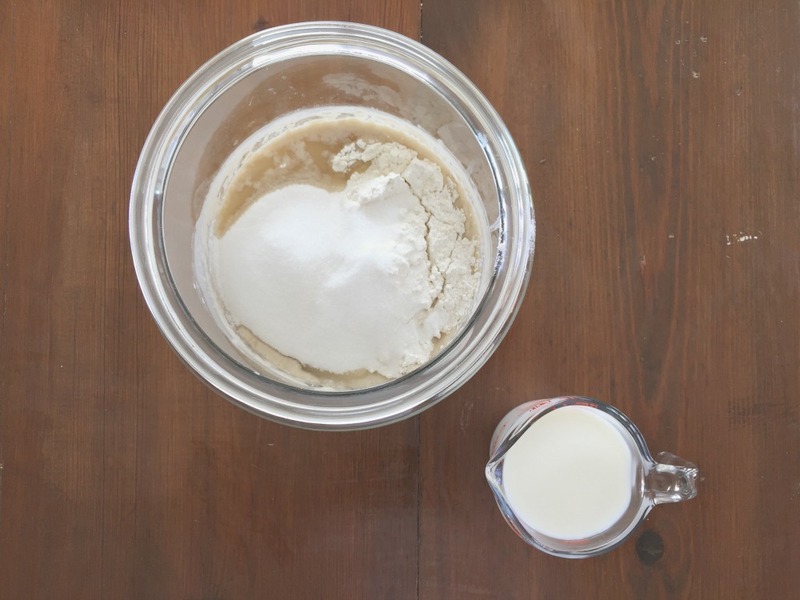 Can I double the flour, milk, and sugar I am adding to feed my starter? I recently made this for a bake sale at work and it was such a hit I decided to make so much more to help supplement income when I quit to care for the kids in a few weeks. So I was hoping instead of having multiple bowls all over my counter I was wondering if I can just double the feeding? I would like to do this but without the extra bags for friends. After awhile the friends have all they need and I can’t stand dumping the extra down the drain. How can I cut the recipe down to just have enough to make 2 loaves of bread and have 1 cup left over to start again? Thanks! Just make the normal amount and instead of giving your friends all the extra just freeze it all. Mark one bag as your 1 cup to start all over again and the rest just thaw them out, feed them 1/2 a cup of each, and bake it. I am going to be baking and selling the friendship bread in this area (everyone thinks it is too much work) but when sales are down I plan on freezing it by the cupful so that I can have some when sales go back up. Plus I need to get extra stored for the Christmas rush! I love this bread! Thanks for sharing the recipe. Hello!! I was wondering… The jar with the blue lid.. Do you close the lid at leave it open?? Hi Janette! I leave it cracked open when it’s on the kitchen counter (you can actually latch it so it pops open about half an inch) but when it’s in the fridge I definitely seal it. Hope this helps! Why would you put it in the refrigerator??? Just curious! Hi Janette! Putting your starter in the refrigerator slows down the fermentation process (so you don’t have to feed it as often) while putting it in the freezer stops it altogether. The fridge is a good option if you plan to bake every couple of weeks — freezing works too but takes a bit longer to get the starter active again. Also, some people want to make sure their Amish Friendship Bread starter stays alive — while freezing works most of the time, sometimes a starter comes out and can’t revive itself to its glory days (usually this is more of an issue with putting in a weak starter to begin with — giving it a good feed a day before usually helps). Hope this helps! I have found that when you end the ten day cycle and separate it that you can refridgerate a few and continue to use them instead of having to wait a whole ten days longer. Just let the serving come to room temp first. Each serving makes two loaves so it lats awhile. Of course I still keep a ten day cycle going and share with anyone who wants some. My question is can this be made in a bread machine? Hi Val! Great input, thank you! And yes, we have a bread machine version here: https://www.friendshipbreadkitchen.com/bread-machine-afb/. The results will vary depending on the kind of bread machine you have, so you may want to treat your first time as a test to make sure you get the settings right. If you end up making it, I hope you’ll post a picture on our Facebook wall! What is day one? The day you stir everything together, the day it is bubbly, or are they the same? Hi Reynaldo! Day 10 becomes Day 1 if you are starting the cycle over again. Happy baking! If you’re using the countertop jar, do you stir the mixture with a wooden spoon rather than mashing the plastic bag, according to the schedule? Yep! Give it a good stir daily! Thanks so much! I can’t wait to get started! Years ago I received a starter and have been wanting to make another recipe, but I didn’t know how to get a starter. So I will definitely be making this. I just want to make sure I do this right. On the first day you add the cups of flour, sugar, and milk. You then add them again in a few days? The ingredient list only says 1 cup of each not 2. Thanks! Also, what % of milk do you use? Whole? And to answer your first question, when you make the starter you follow the directions and ingredients. Then you have to break out the flour, sugar and milk again on Day 6 to do another feed of 1 cup each. On Day 10 you add 1½ cups of each, divide, and share the starter (and bake with 1 cup yourself if you want). The ingredients listed are on for the first day of making the starter only, which I know seems a bit confusing, but that’s traditionally how it’s been presented and you’re probably not going to reserve a cup of milk for 6 days, LOL. Let me know if that answers your question! My granddaughter tried this bread and will not stop eating it. She loves it. I had not had a starter in several, so I was glad to get one from a friend. I am going to make a couple loaves and take to work. Also gave a starter to my daughter, so she can make more for my granddaughter. I tried the starter. It was easy and fun. I made the bread for myself and my daughter then a shared the started with 5 people at work. Hi, I was gifted a bag of starter from a coworker and followed the 10 day routine, made the bread and it was great. My question is I came across a article awhile back stating that while following the 10 day routine it should be kept in the refrigerator as it is not safe to keep it out on the counter for that length of time. Any comments on that? It’s best to keep it at room temperature in order to allow the yeast to do what it needs to do. 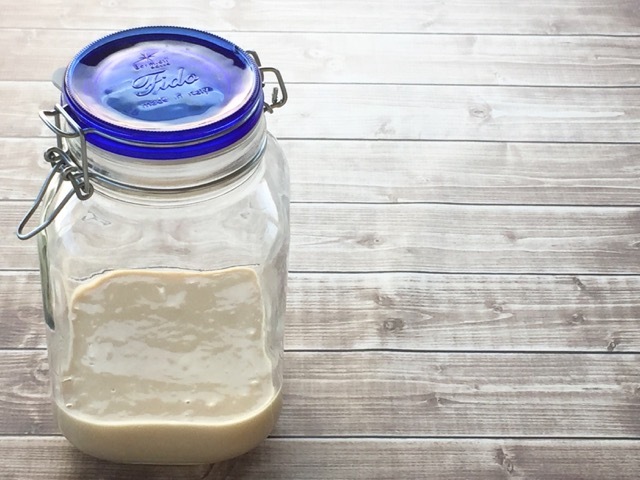 Most sourdough starters are kept at room temperature. You can move your starter to the fridge, but it will slow the fermentation process considerably and lengthen the feeding cycle. As long as your starter is bubbly and has a tangy, yeasty-sweet, fermenting smell, it should be safe. If it turns colors or smells suspicious, best to throw it out. Hope that’s helpful. If you have any other questions, be sure to visit our FAQs page (https://www.friendshipbreadkitchen.com/faqs/). Also check out on how to tell good starter from bad starter (https://www.friendshipbreadkitchen.com/tutorial-good-vs-not-so-good-amish-friendship-bread-starter/). Thanks for being a part of the Friendship Bread Kitchen! So excited to find this. Fifteen years ago I had a rotation going w friends but then we moved…I’m excited to find this and get it started – just in time to get it started and get to baking day to share mini loaves of bread and starters w each of the children in my preschool class for Valentine’s Day! Also glad to learn I can freeze a starter! What if anything do I add to prepare my 1 cup batter to bake? No problem, I’m glad it worked out! What did you end up making on Valentine’s Day? In theory it should work if you halve the starter recipe (was that what you mean? ), but I’d recommend making the starter per the recipe. Then you can decide if you want to halve the bread recipe. I think it’s still easier to follow the recipe in it’s entirety and give the extra loaf away or even freeze it — the bread keeps well. You can freeze the remaining bags if you don’t feel ready to maintain the starter on a regular basis. I think it would be hard to manage a “one loaf” starter baggie but you can certainly try it — just make sure your friends know they have to halve every recipe in order to make sure it works. I made my own starter per your directions in FEBRUARY. I made it through 3 10 day cycles The bread was fantastic! I’ve made the original, lemon poppyseed,and double chocolate. On Sunday I removed 1 c.of frozen starter to begin a new jar’s 10 day cycle. Today is day 4, and no bubbles ! Should I add flour,sugar,and milk, and act like it’s day 6, or just ditch it ? I would definitely feed it, Finn, and see if you can revive it. We have a tutorial here: https://www.friendshipbreadkitchen.com/tutorial-reviving-frozen-amish-friendship-bread-starter/. It takes a while to get it as robust as pre-freezing (it needs to be fed and kept at room temperature), but if it smells good (and has been fed since you’ve removed it from the freezer), it should be fine! My husband accidentally bought bleached flour. I’m wanting to take my starter out of the freezer and revive it. Will the flour hurt my starter? No, it shouldn’t make any difference at all. I’ve done the same thing. It’s pretty hard to mess it up. I have made this starter for a gazillion years. I had originally gotten it from a co-worker and then after she had quit no one knew the recipe for the starter so I’ve been making it all these years without the yeast and it works perfectly. No one knew it was in there. Just thought I would let you know. My taste buds have been screaming for cinnamon twists for a couple of weeks – you know, the kind you get from a good bakery – so I started looking around the web for a good recipe to make my own. It’s always my preference if I can handle it. Guess what site I landed on! With no starters in the area that I know of, I am doing my own and plan to pass them out at church next week. I’m on Day 4 of my first adventure and am so looking forward to some really good cinnamon twists in another week! It’s kind of funny because I’m in east central Indiana and there are Amish communities all around me, and a couple of great Amish shops, but no friendship bread starters! Thank you for sharing this with us. My taste buds are drooling! Yes, that should work fine, Adam. We’ve substituted rice milk and almond milk as well. If I had 6 starters and I keep one to bake bread. The other 5 I want to keep in a large jar. How much do I feed it and can I take out a cup to bake at anytime. I would just feed it every 6 days like Day 6 (1 cup flour, 1 cup milk, 1 cup sugar), Steve. The bigger it gets, the more you’ll need to feed it so I would try to only keep 2-3 cups of starter on the counter at a time, max. Good luck! I have a 1-year old homemade sourdough starter that I made with flour and water only. I named her Lizzie, she’s brilliant! I am wondering if I could add a bit of my starter into this Amish starter recipe for a kick-start instead of commercial yeast. What do you think? Has anyone else tried this? Thanks for the recipes. I’m really interested in your cookbook. Hi Terri! Yes, I think Lizzie would make a great addition to your Amish Friendship Bread starter! Let me know how it goes, and welcome to the Friendship Bread Kitchen! It worked great, I’m happy to report. I’ve made bread twice now. A bunch of bread! I made the cinnamon and pecan friendship bread and also the rustic Amish bread. Both kinds of bread turned out very nicely. It was just like my grandmother used to bake. I must say it’s more difficult to give the starter away these days. I guess most people just don’t bake anymore. I’m happiest when I’m baking! I was into making Amish Friendship bread years ago. I want to give it a go again. If I begin the starter on day 1 in a ceramic bowl can I transfer to another container for day 2 and not mess up the process?